This weekend we had a blast of cold weather, with actual snow that stayed on the ground. It was pretty and a quick stroll out put me in a cheery mood, but it was cold, very cold, so I needed a warming wine. 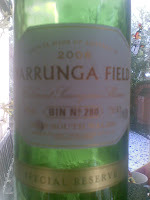 We had a Yarrunga Field Cabernet Sauvignon Shiraz 2006 with a game of Twilight Struggle. Inspired by the snow I took the USSR role. The wine was warming. It’s one I’ve had before, and one that still doesn’t seem to reflect the label. It’s yeasty with chocolate and spice, but the dominant theme is fruit. There’s damsons and blackberries and some blackcurrant jam. It was a perfect choice for bringing some sunshine into a snowy evening for less that £6.